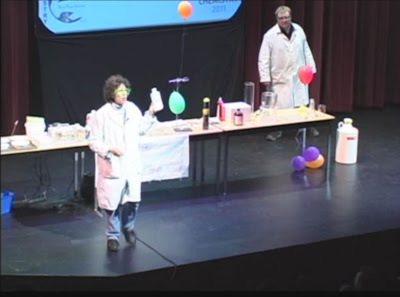 Last month the College hosted four free lectures in honour of the provincial government's Year of Science. Hundreds of faculty, staff, students and members of the public streamed through the doors of the Laura C. Muir Performing Arts Theatre, New Westminster Campus, to listen to experts speak on matters relating to climate change, nanotechnology, psychiatric disorders and more. If you missed any of the lectures - or would like to revisit them - they are just a click away. Where Darwin meets Freud: psychosis and autism as diametrical disorders of the social brain Bernard Crespi, a professor of biological sciences at SFU, delivers his groundbreaking theory that psychiatric disorders such as autism and psychosis have a shared genetic basis. The New York Times hailed Crespi's theory as providing "psychiatry with perhaps its grandest working theory since Freud." Towards a Healthy Environment Using Coal, Oil and Gas: What are the long-term implications to climate change? William Gunter, an expert in geochemical processes and their impact on the environment and on the oil and gas industry, speaks on how capturing carbon dioxide and burying it underground can mitigate the effects of climate change. Designer Nanomaterials: materials to meet the challenges of today and tomorrow Ever wonder what nanoscale materials are or what role they might play in your everyday life? Join Byron Gates, associate professor of chemistry at SFU, for a discussion on how these materials are becoming increasingly important in new technological developments - and the controversies surrounding them. Stinks & Bangs Join the Science in Action team from SFU as they turn water into wine, make things go bang, coax solutions into magically changing colour and much, much more in this truly Scienctacular Show. Get smarter at Student Research Days! Help grow the reading culture in Uganda! DCBA hosts free tax service!